Individuals and groups support the Gathering in unique ways. We are so thankful for their generosity—and creativity! Check out the Great Examples of Giving detailed below. If you are inspired by these stories and have a unique way you can help the Gathering, we would love to hear from you! Please call the Gathering office at (414) 272-4122. The Gathering's Thanksgiving meals require a community: Thanks to St. Mark’s Episcopal, Immanuel Presbyterian, Fox Point Lutheran, Mt. Carmel Lutheran for cooking the 90 turkeys needed to feed 700 plus guests; Christ Church Episcopal, Milwaukee College Prep, Jewish Day School, Joy Global and a host of individuals for supplying the 150 pies, and Menomonee Falls North Middle School, St. Paul's Episcopal, and Mt. Horeb Baptist for hundreds of themed placemats. Neziah (far right in the photo) was competing for Miss Wisconsin 2017. “Since one of the purposes of the USA pageants is to promote women to provide humanitarian efforts to affect positive change, I felt the need to personally do more than simply raise funds in order to compete.” Neziah and her family baked hundreds of cupcakes, sold them at a fundraiser on August 27, and donated half the proceeds to The Gathering. For several years now Maureen Shebesta, ably assisted by her husband Gary, has prepared holiday treat bags for our guests who are children; usually for Valentine’s Day, Easter, July 4th, Halloween and St. Nick’s Day. What a beautiful gift! 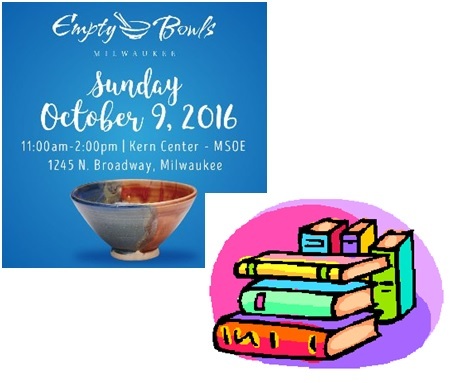 Two community fundraisers gave to The Gathering in 2016: Milwaukee Empty Bowls raised over $65,000 at their October event, $8,000 which will go to The Gathering’s meal programs; All Saints Cathedral’s Hunger Book Sale raised over $40,000 at their August event, $5,000 to The Gathering. St. Paul’s provides items for Gathering guests on a quarterly basis. Received in November were caps, gloves, socks and other items to warm our guests as the cold weather begins.